Jaguar Land Rover is offering female students interested in engineering, technology and manufacturing careers a unique insight into the world of work at the UK's largest luxury automotive manufacturer. Know' course has been developed in partnership with Birmingham Metropolitan College to change outdated perceptions of engineering to encourage more young women to consider engineering and manufacturing careers. Only 6 per cent of the UK engineering workforce are women therefore the course will increase the talent pool for Jaguar Land Rover and the wider UK manufacturing sector. More than 100 young women from across the Midlands and Merseyside are participating in the first national programme being managed by Education Business Partnership Centres at the company's advanced manufacturing plants in Solihull, Castle Bromwich and Halewood. The students, aged 15-18, spend a week touring manufacturing, design and engineering sites, meet women from all levels of the business to find out about their career experiences and spend a day on work experience with a female mentor. They also find out about Jaguar Land Rover's apprentice and graduate schemes and participate in workshops on job applications, assessment centres and interview techniques. Students participating in the programme will receive a new Level 1 Award in Employability and Personal Development. To achieve this vocational qualification, students must demonstrate they have experience applying for a job, working on interview skills, have contributed to a team and have an environmental awareness, all of which are covered during the week-long programme. "Jaguar Land Rover has ambitious plans for growth and it is engineering talent that will develop the products and technologies that appeal to customers in the future. We believe that the success of our global business - and the UK economy - lies in engineering and innovation," said Les Ratcliffe, Head of Community Relations at Jaguar Land Rover. "We offer a wide range of education programmes with the aim of getting young people excited about engineering and crucially, to encourage them to make the right subject choices at GCSE-level and beyond. 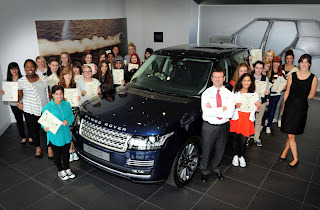 The 'Young Women In The Know' course has been developed to encourage female students to consider engineering careers and we hope some of the students on the course today will join Jaguar Land Rover as engineers in the future." Danella Bagnall, Project Planning and Integration Director at Jaguar Land Rover, added, "I started my career as an apprentice 25 years ago which was a great way of continuing education, developing skills, and getting into industry. I am now a senior engineering manager which demonstrates the excellent career progression opportunities available to women in a modern engineering-led business like Jaguar Land Rover." "It is a very exciting time to join our business. We are investing £2.75-billion a year in research and development and we need talented young people to deliver new technologies, new applications, new approaches and new ideas. I would thoroughly recommend a career in engineering to girls and hope this programme inspires lots more women to become engineers." The 'Inspiring Tomorrow's Engineers: Young Women in the Know' course is part of the 'Inspiring Tomorrow's Engineers' education programme which Jaguar Land Rover runs across the UK to promote STEM subjects and engineering careers.